What do you know? Another cat dress! As much as I am trying to dress more like my age, more chic, and not too "cutesy"; cat print is something I just cannot resist. It was up in the 90s yesterday so all I wanted to wear was a simple dress. I wore this cat print dress from H&M with the black Stevie bag from Lauren Merkin. Since I rarely wear black, wearing black from head to toes is even more unlikely. I added a touch of color with these suede booties from Lulu*s in the prettiest shade of teal. They also have some fancy knotted lattice details around the ankle too! Lastly, I wore all Tiffany Kunz jewelry... the cuffs and the rings. I love how minimal and versatile her pieces are, I seriously wear them all day everyday! Teal suede booties by O'Neill c/o Lulu*s.
Bold Arc ring (coming soon) c/o Tiffany Kunz. 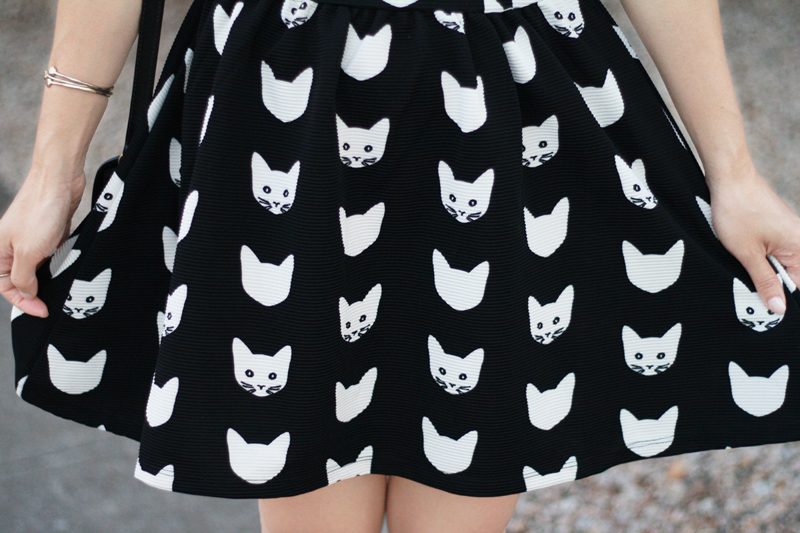 Ahh, kitty print dress! I want it. I've been admiring this cat print dress on everyone. I wish I had one too! It's just so adorable. Plus it looks awesome with your blue boots! I bought this dress over the summer and can honestly say it's one of my favorite pieces ever. You look gorgeous in yours! What the what! I was at H&M just yesterday and this lovely dress was nowhere to be seen. Is it older? I got it about 2-3 weeks ago.